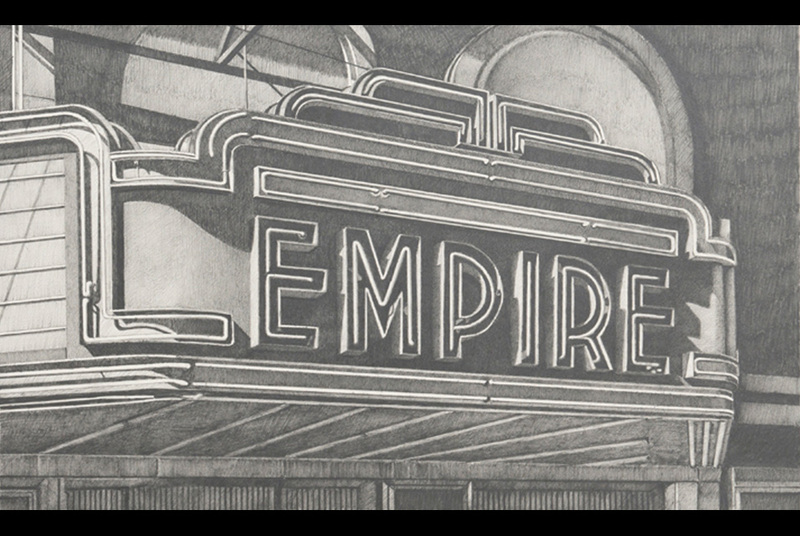 Robert Cottingham, Empire, 2008, graphite on paper, 17 1/4 x 28 inches. © Robert Cottingham, courtesy of Forum Gallery, New York. NEW YORK, NY.- A famous movie theater in Montgomery, Alabama, the site where Rosa Parks started the Civil Rights Movement, is the subject of an exhibition of new work by Robert Cottingham at Forum Gallery from February 24 through April 9, 2011. Empire will focus on nine paintings and drawings from 2008-2010, depicting the theaters marquee in oil, watercolor, gouache and graphite. Many of the paintings are monumental in size, which intensify their dramatic effect as they salute a bygone era. Robert Cottingham is known for imagery that celebrates the history of communications in America, specifically signage on urban storefronts, iconic communication devices such as vintage typewriters and cameras, and signs on railroad cars. The Empire series is an exploration of urban history, and the exhibition is an examination of the Artists consistent process. In 2008, Cottingham was asked by Lincoln Center to create an image for the anniversary of their Film Festival. Looking for a topic that would inspire him, Cottingham found the photos of the Empire Theater he had taken 12 years before. The subject of the search, the history of the place, the meaning of the word and the look of the theater came together for him. Like Andy Warhol and James Rosenquist, Cottingham emerged from an advertising background. Together with Richard Estes and Chuck Close, Cottingham is considered to be one of the most important of the seminal photorealist artists. Robert Cottingham lives and works in Western Connecticut. He was born in Brooklyn and educated at the Pratt Institute. His paintings and drawings are collected on an international level; his work is in the collections of Metropolitan Museum of Art, New York, NY; Museum of Modern Art, New York, NY; Philadelphia Museum of Art, Philadelphia, PA; Smithsonian American Art Museum, Washington, DC; Solomon R. Guggenheim Museum of Art, New York, NY; Whitney Museum of American Art, New York, NY; Yale University Art Gallery, New Haven, CT; Sentra Museum, Berardo Collection, Lisbon, Portugal, and Boymans-von Beuningen Museum, Rotterdam, Netherlands, among others. Cottinghams work has been featured in solo and group exhibitions throughout North America, Europe and Asia.